This is the book that you didn't know you so badly needed! Little & Lion is a relevant and raw story about love and a bond between a brother and sister. It delves into the depths of mental illness, giving you an inside look at the affect it can have on a family. The YA book scene has been introducing more and more LGBT characters and I can't put into words how much I love this and how important I think it is. We are living in a world where acceptance is being tested. People are falling back into the shadows with the fear of being ostracized for who they are. The more we have strong role models, in fiction and real life, the more we can rally together, stand strong and live our most authentic life. The book comes from the perspective of Suzette(Little) who is struggling to define who she is. Brandy Colbert delivers Little's story at a perfect pace. Piece by piece we learn Little's back story and how she was brought to the position she is currently in. Throughout the novel we are also introduced to an outstanding cast of characters. Lionel(Lion) is Little's stepbrother but they share a very deep bond that some straight blood relatives don't even have. They are deeply connected and that radiates off of the pages. Lion was diagnosed with Bipolar disorder and we witness throughout the novel the effects this has on Lion, his process on living with this new diagnoses and how the family is coming to terms with it. 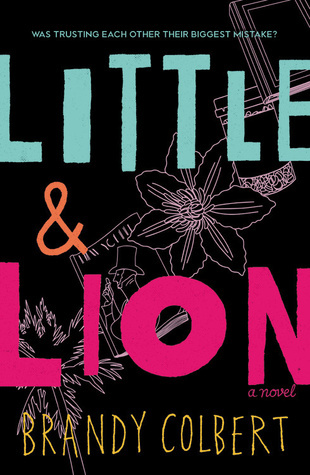 Little & Lion is a coming-of-age story. We watch so many characters grow throughout the entirety of this novel, even Little and Lion's parents. Each character has a colourful back story and you won't be able to help falling in love with each one. If I had to sum up Little & Lion in one word I would say: Diverse. It has a very diverse cast of characters and an even more diverse storyline. It goes there. It gets raw and the author tells it like it is. She crafted bold characters that have very powerful voices; and I believe these voices will speak to all of the readers that have the privilege of reading this story. I believe with books like this, we can change the world. We are taking the right steps but stories like Little & Lion really put things on the map and into action!